The R-PLEX Human TNF-RII Antibody Set includes a matched capture and detection antibody pair and calibrator for the quick and easy measurement of TNF-RII in biological samples. R-PLEX products leverage MSD’s electrochemiluminescence technology for better sensitivity and a larger dynamic range than traditional ELISAs. R-PLEX matched antibody sets enable the development of singleplex and multiplex immunoassays. Individual assays may be developed using MSD avidin- or streptavidin-coated plates. Custom multiplex assays with any combination of R-PLEX analytes, as well as R-PLEX plus U-PLEX analytes can be developed on U-PLEX MULTI-SPOT plates. To learn more about the advantages of R-PLEX products click here. 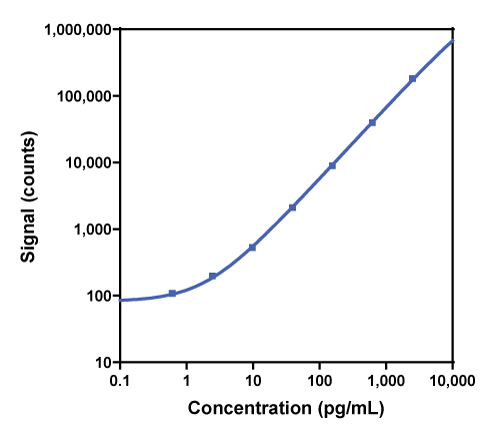 Calibration curve for the R-PLEX Human TNF-RII Antibody Set was assessed and representative data is presented below. Description - Tumor Necrosis Factor-Receptor 2 (TNF-RII, p75, TBPII, TNFBR, TNFR2, CD120b, TNFR1B, TNFR80, TNR-R75, p75TNFR, TNFRSF1B) is one of two receptors for TNF-α. TNF-RII is activated by both soluble and membrane bound forms of TNF-α and is found in a limited number of cell types, making it a more suitable drug target than TNF-R1. Three pathways can be activated; the anti-apoptotic NF-κB pathway, cellular differentiation and proliferation mediated through the MAPK pathway, and apoptosis or cell death signaling. Profiling of sputum inflammatory mediators in asthma and chronic obstructive pulmonary disease.